Ginger has a long history of use in folkloric medicine. Currently, modern research and scientific studies have confirmed many of the medicinal uses of ginger, yet there is still much to learn. Effects of a ginger extract on knee pain in patients with osteoarthritis, Arthritis and Rheumatism, 2001. This ginger study evaluated the safety and efficacy of a concentrated ginger extract in patients with osteoarthritis of the knee. In a six-week, double-blind trial, 247 patients received either ginger extract or placebo twice daily. While the effect was moderate, the group that received the ginger extract experienced a statistically significant reduction in symptoms of osteoarthritis of the knee. A randomized comparison of ginger and dimenhydrinate in the treatment of nausea and vomiting in pregnancy, Journal of the Medical Association of Thailand, 2007. 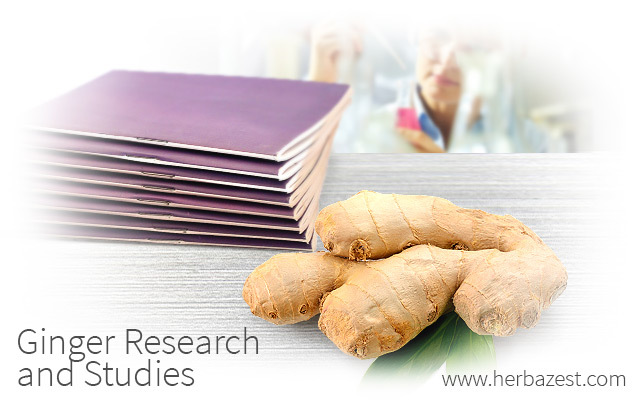 The objective of this ginger study was to compare the efficacy of ginger and dimenhydrinate for treating nausea and vomiting during pregnancy. 170 pregnant women were randomly divided into two groups. One group received a 0.5-gram capsule of ginger twice daily and the other received 50 mg of dimenhydrinate twice daily. The results suggest that ginger may be as effective as dimenhydrinate for treating nausea and vomiting during pregnancy, but with fewer side effects. The Effects of Ginger on Fasting Blood Sugar, Hemoglobin A1c, Apolipoprotein B, Apolipoprotein A-I and Malondialdehyde in Type 2 Diabetic Patients, Iranian Journal of Pharmaceutical Research, 2015. The objective of this ginger research was to evaluate the effects of ginger on serum levels of fasting blood sugar in type 2 diabetic patients. 50 men and women (between 20 and 60 years old) with type 2 diabetes were randomly divided into two groups which received either a ginger or placebo capsule twice daily for 12 weeks. Ginger improved a marker for long-term blood sugar levels, as well as reduced markers for oxidized lipoproteins - major risk factors for heart disease. This research suggests that ginger may lower blood sugar and the risk of heart disease. Enhanced maze performance and reduced oxidative stress by combined extracts of zingiber officinale and ginkgo biloba in the aged rat, Neurobiology of Aging, 2002. This research assessed the effects of a ginger mixture on learning, memory, and indicators of oxidative stress in rats. The effect of the ginger mixture on 22 - 24-month old rats was compared to the performance of three-month old rats who did not receive the mixture. Two major indicators of oxidative stress - oxidized proteins and lipid peroxidation - were significantly reduced in the rats that received the ginger mixture, suggesting that ginger reduces oxidative stress and facilitates spatial learning. While a collection of ginger research and studies has confirmed many anti-nausea, anti-emetic, and anti-inflammatory ginger properties, there is still much to learn about it. Animal studies have suggested new applications for ginger, but further research is still necessary to confirm its pharmacological effects.